Boneyard Ridge is a shining example of how private land conservation enhances habitat connectivity across the landscape. It lies between and adjacent to Elmer Feldenheimer State Natural Area and Ecola State Park (globally significant for its biodiversity, located along the ocean shoreline) and NCLC’s own Circle Creek Habitat Reserve (an active restoration site, occupying the Necanicum River floodplain). Altogether the four properties create a contiguous 3500-acre conservation corridor on Tillamook Head, the northern Oregon Coast’s most iconic headland. The property includes four streams, including 2 miles of salmon-bearing streams, which support not only spawning coho salmon but cutthroat trout and Western brook lamprey. It serves as a home or migration stopover to at least 90 species of birds, including pileated woodpeckers, olive-sided flycatchers, bald eagles, and rufous hummingbirds. Amphibians on the property include red-legged frogs and Columbia torrent salamanders, and mammals here range from black bears to elk. Even more native wildlife species are known to inhabit Ecola State Park and may already have spread into Boneyard Ridge. 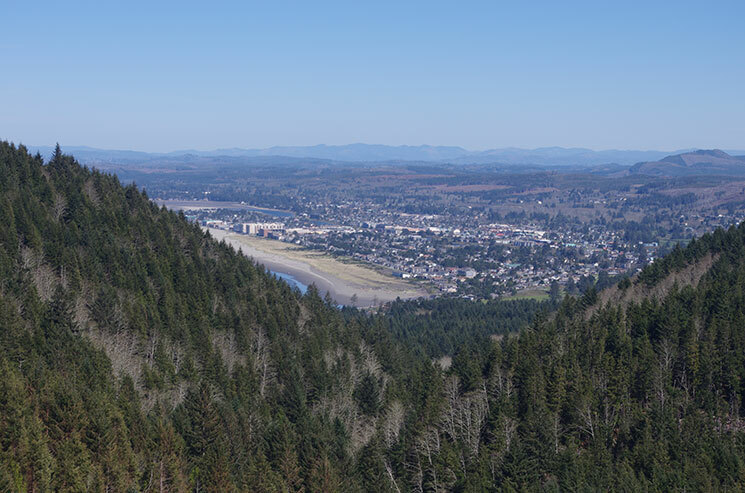 It is the land you see when you gaze south at Tillamook Head from Seaside or from the top of the Astoria Column. The forestland here has been commercially logged for decades and currently ranges from recovering young stands to trees some 50 years old. NCLC’s challenge going forward is to utilize the latest findings in restoration science to put the property on a healthy trajectory toward maturing into a high-functioning rainforest. Funding: Oregon Watershed Enhancement Board, Gordy Allen and Jan Stewart, Gaylord–Eyerman Family Fund of the Oregon Community Foundation, Mintkeski Family Fund, Nancie McGraw, Judy Sorrel, and more than 120 additional donors.